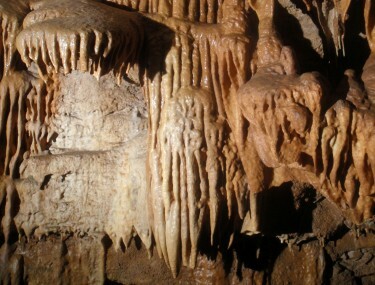 Vandals and careless visitors have damaged many of the caves around the United States, including caves in the Ozarks. Caves can be damaged by thoughtless or reckless human visitors or polluted from poor land management above them. There was a time when cave conservationists could only look at the damage and be saddened at the loss of endangered species habitat, missing or broken speleothems, ugly and even obscene graffiti and soiled flowstone. Today, increased knowledge and advancement of technology has made it possible for cavers to repair the damage. We can restore habitat, reattach speleothems, remove graffiti and remove or mask muddy stains on flowstone. Among the Springfield Plateau Grotto membership, we have some of the most experienced cave restorers in the United States. No wonder. One of the local managed caves is a restoration laboratory! 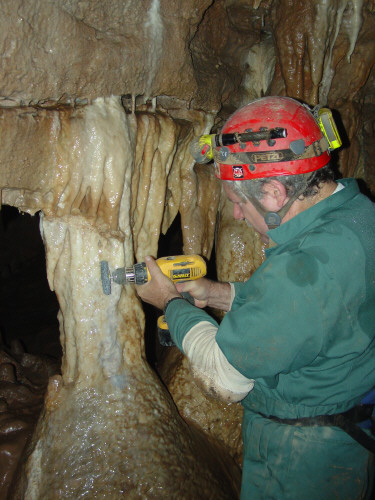 Many experimental methods have been developed in Breakdown Cave and other caves to reattach broken speleothems and remove graffiti and mud stains. What a difference restoration makes! Buffing muddy prints on a speleothem. Many caves that were filled with trash and graffiti and had many broken speleothems and soiled formations have been restored so that their appearance is vastly improved, and the natural beauty that vandals robbed from them has been returned. Those who participate in cave restoration have a sense of pride and accomplishment. It is this pride and the responsibility that comes with it, that is the reason why members of SPG and many other cavers restore caves.